I have spent years looking at pictures of Austin - and these are my favorite - most outrageous beauties! This is the view most people associate with Austin. 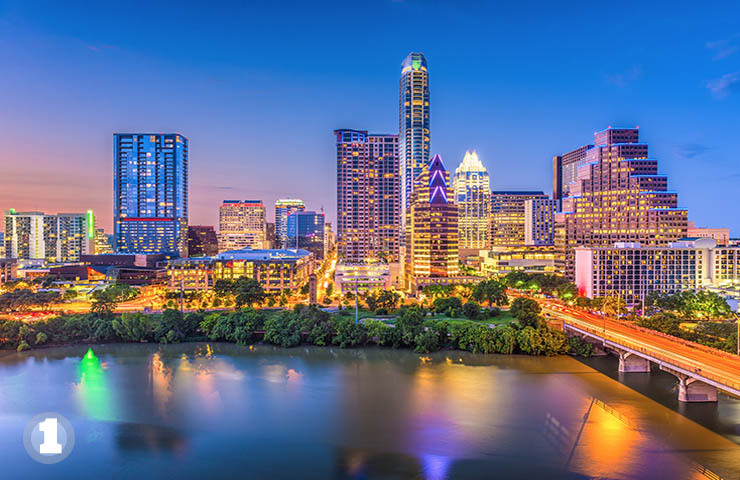 In picking images of the Austin skyline you have to watch for the changing skyline. 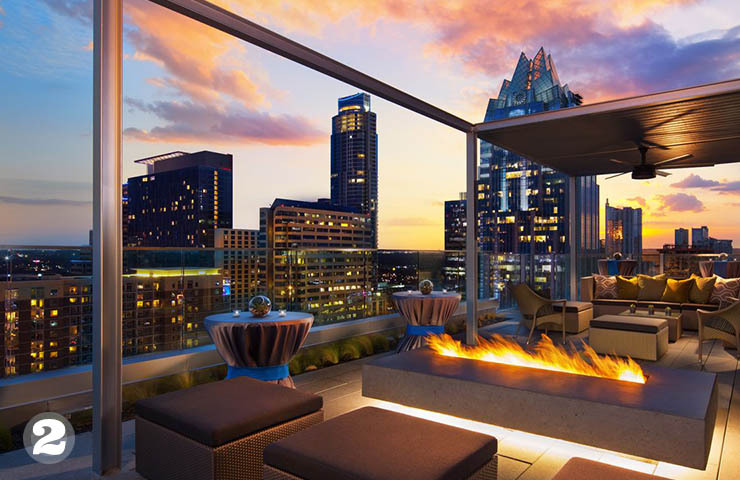 Nothing can date the images of Austin you use in your website and marketing materials if a new building is missing. This is especially challenging if you aren't a local and not current on the latest new skyscraper or condo tower. 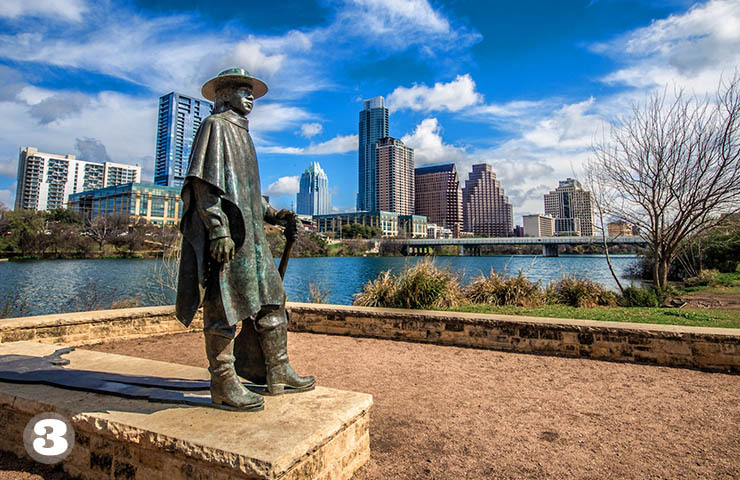 No where is it more apparent what has been happening to Austin than to look at the skyline. We have out-of-control grow that is making the city increasingly unlivable. Traffic is horrible. Our bad traffic ranks near the top of worst places to drive and commute. Housing costs have gone through the roof and are still climbing. It seems like everybody wants to live here and is planning to do so. We have excellent jobs but they are not as high paying as you would expect because many UT grads decide to stay here after graduation and the job market is full of highly educated and over qualified people. This picture is full of saturated colors - it is almost a rainbow of them. 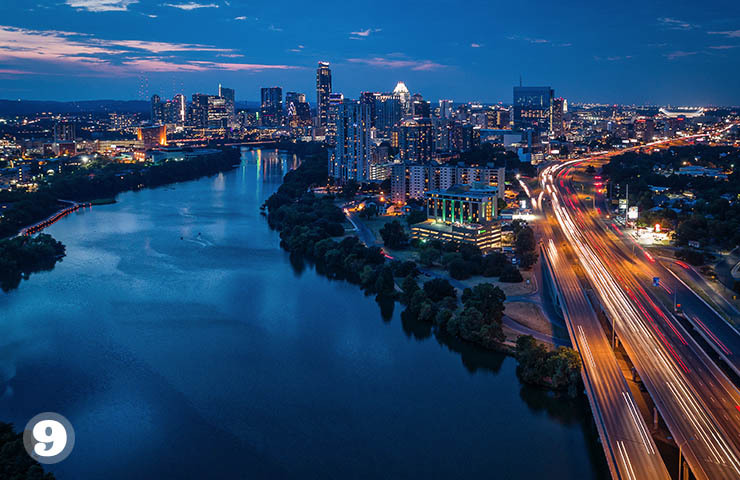 I have called it the Emerald City because that is really how Austin appears - especially to non-residents - beautiful and alluring. The fire in the pit seems to be reflected in the sky. There are some great touches of blue, too. I like this picture of the Azul lounge - you can almost feel the heat and what a view! This is a great picture to illustrate nightlife on Austin. But where are the people! This place should be packed. If you take pictures with people in them and use them professionally you have to make sure you have releases from them to use their image. One advantage to using stock photography is that you know you don't have to worry about using them in websites and marketing materials. You may not have noticed that even the biggest magazines use stock. One assumes that their cool color spreads are photographic sessions ordered by the job, but most are not. I was looking for some pictures for a home builder website last week and saw the same white kitchen pictures being used in a dozen of the top websites and in their print magazines. The pictures looked fabulous -on the level of Architectural Digest. I really like this picture for the incredible blue sky - wow great clouds there - and the weathered green patina on the bronze statue. The slight rusty color of the gravel and the light yellow limestone are nice earthy color contrasts. There are also many cool contrasts in surfaces, look at the soft blue and glassy water with that crushed gravel and the grass. This was a winter picture - you can see the trees are without leaves. 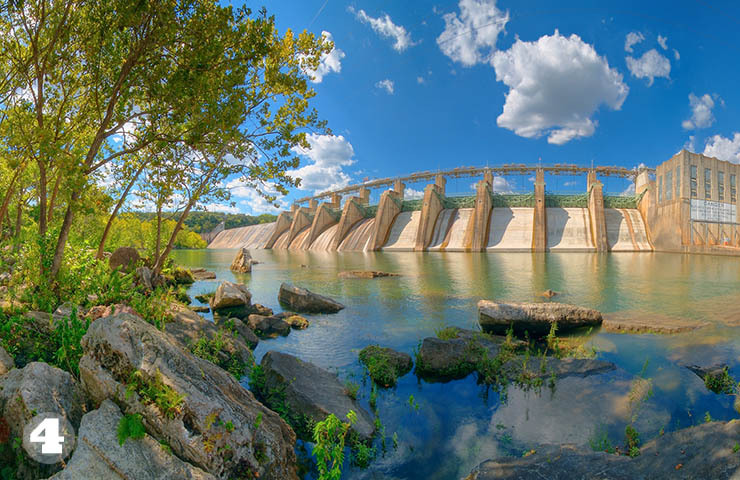 If you aren't from Austin you will ask - does this dam really look that great? Yes and it does, it was built in 1941 and looks vaguely Art-Deco or WPA. It was commissioned in 1937. 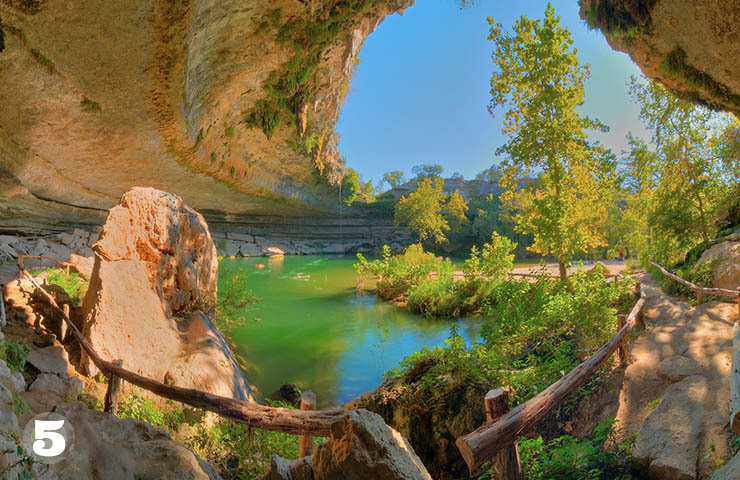 Hamilton Pool Preserve is a natural pool that was created when the dome of an underground river collapsed due to massive erosion thousands of years ago. The pool is located about 23 miles west of Austin, Texas off Highway 71. Our landscape has been shaped by the interaction of water and limestone like this. I like this picture because it really captures the sweeping arc of the limestone cliff. The wood railings twist around like dinosaur bones. My brother thinks the Hamilton Pool is the most incredible natural wonder we have around here. Once again the colors in the water are jewel-like, but in this case they are caused by a high-bacteria level in the pool. You have to make a reservation to go here in the summer and pay for admission. Yes, this image looks like a scene from the Ten Commandments by Cecil B. DeMille. Ah, echoes of Vista Vision here. A highly saturated Technicolor world. 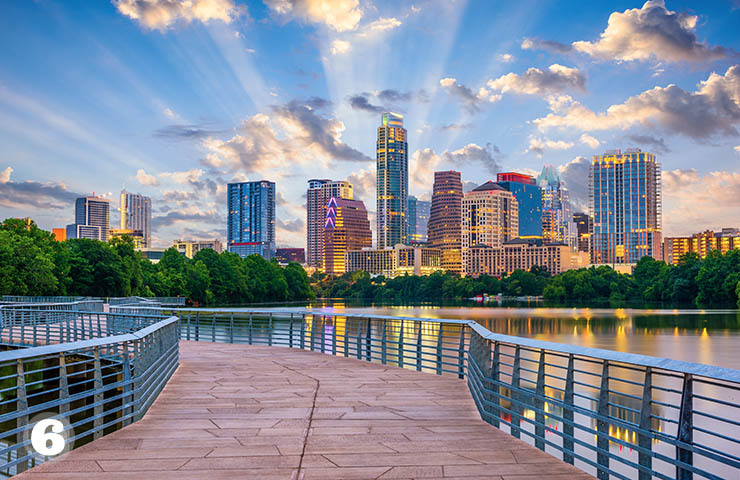 I like this picture because of the the contrast between the patterned metal railings, the textured concrete pathway with the water and the awesome skyline of Austin across the back. There are red, purple, blue and gold lights on the buildings. Austin really glows like that at night. Like many places in central Texas we get these fast changing cloud patterns. Clouds sweep rapidly across the landscape and we really get those dramatic light rays. The lush green trees along the lake are pretty, too. People prefer blues and greens over all other colors. Deep royal blues - we use them all the time in websites. People trust websites with blues in them - rich skyblues like this. Dark navy blues convey trust. The main thing to remember about blues is they must always contain some green in them. Blues that tend towards purple can feel brittle and stand-offish. It's the same with greens - greens that tend towards blue are preferred by most people. I think there is something genetic in how we react to colors. Blues and greens feel more natural and healthy - we want to be around them. They are the colors of clean water and freshness. You can do a lot in a website with various blues combined with some green and reddish oranges and golds. The Texas bluebonnet or Texas lupine is a species of lupine endemic to Texas. 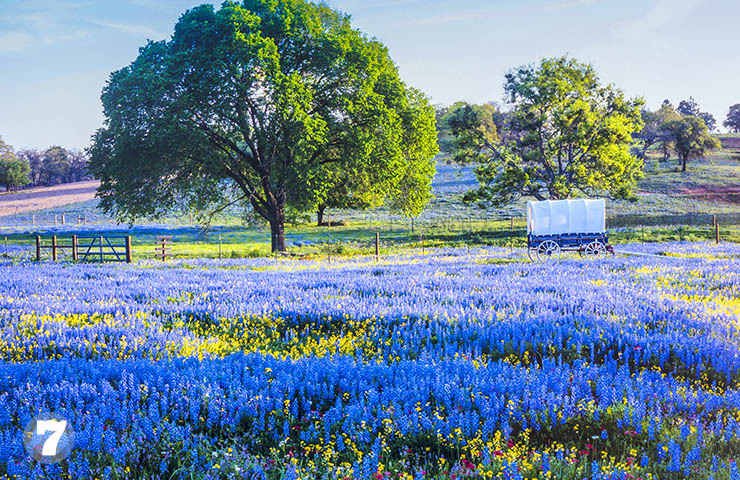 With other related species of lupines also called bluebonnets, it is the state flower of Texas. It really does look like this at the height of the blooming season. For my eyes - and everyone sees colors differently - the color of bluebonnets is a bit strange and unnatural. The blue trends toward purple a little. What I like about this picture is it really shows how the flowers seem to grow in lush waves. They really are this thick and beautiful. In websites we build for Central Texas companies our customers ask for at eat one picture of bluebonnets. I think I have looked at a hundred this year alone. This picture has a pale sky and in the background are some soft purple mauves - that's a nice delicate touch in contrast to the bold color of the flowers. The raking light hits the trees and sets off the green nicely, too. So, this is my favorite Texas bluebonnet picture. The arches of the Pennybacker are so strong they are almost brutalist architecture. It was built in 1982 and crosses Lake Austin and the Colorado River. In Summer the rust colors of the bridge blend nicely with the hills and the lake. When you comedown the 360 hill and cross the bridge you get a feeling of of power - like taking off in a jet plane. 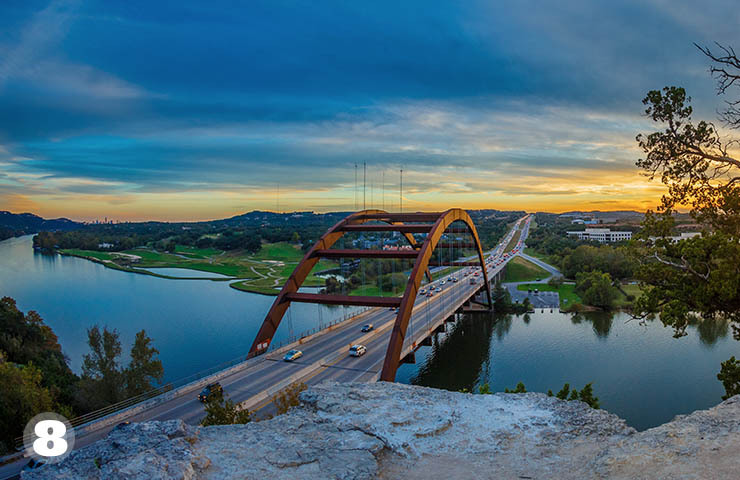 The bridge has become one of Austin's seven wonders of our world here. This image is rich and strong - just like the bridge. The deep blues of the lake and the bits of green lawn look wonderful together. The sunset adds oranges and golds that go so well with Lapis and deep teal blues. I like the sweeping arc of the gold and red headlights crossing the dark blues of Lake Austin. Those bright green lights on the side of a building add a nice touch that is mirrored in the water of the lake. There are a number of converging lines here that give the picture a lot of life. The dark green trees along the lake make a jagged edge that adds more energy in the darkness or the navy blue water. It's not obviously Austin. This panorama of the city is not as familiar as others are taken from across the Lake. I assume it was taken with a drone. This image has a lot of pop and it is one of my favorites. Lake Austin looks so rich and deep. I love the darkest blue you see right were it passes underneath the bridge. I would call that a deep Cobalt blue. Farther up the lake you can see Cerulean blue reflections. Cerulean is a color term that ranges between blue and azure. Pantone (the color people) called pale cerulean the color of the millennium. This picture contrasts with all of the other ones I have selected because it is flat and graphical. The dull tomato red and the rusty orange blend well with the sky blue and the white. 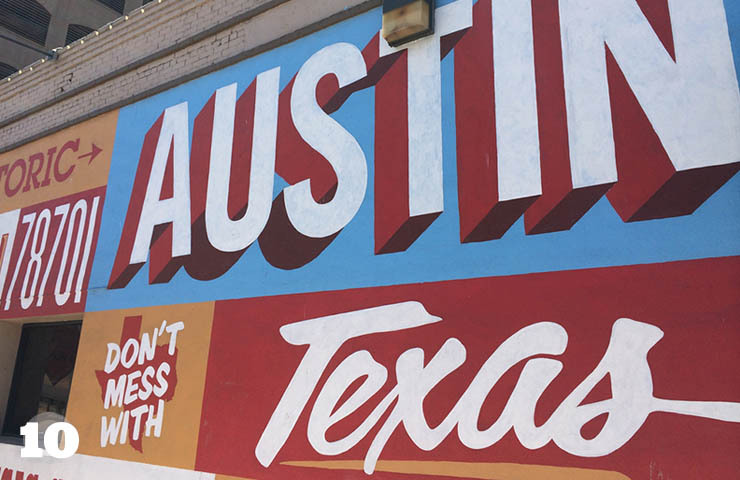 I picked this image because it conveys something of the sassy Austin spirit. True red - let's call it Coca Cola red - is a very challenging color to use. It can be so strong that it overpowers and other color. You have to pair it pure white. On the web JPEG compression of reds is very iffy - you get weird pixelation or artifacts in the color, even at the highest quality of compression. GIF works better as a format for red graphical elements in websites. In this picture we don't have any problems with rendering the red because it is less saturated and is almost brown. Putting red next to blue like we see in this picture is normally a serious no-no in color pairings. Putting them together can cause a mental sensation of vibration that can be disturbing. One can sense this a little if you concentrate on the line between the colors.